This example will guide you through the steps needed to add a basic RadPath control in your application. Geometry: You should set an object of type RadPathGeometry which will provide the geometry that needs to be visualized. The RadPathGeometry consists of different RadPathFigures. Stroke: You can use this property to set the stroke color. StrokeThickness: You can use this property to set the thickness of the stroke. BackgroundColor: You can use this property to modify the color of the rectangle which contains the specific figure. You need to set the Geometry property of the RadPath instance for it to visualize properly. 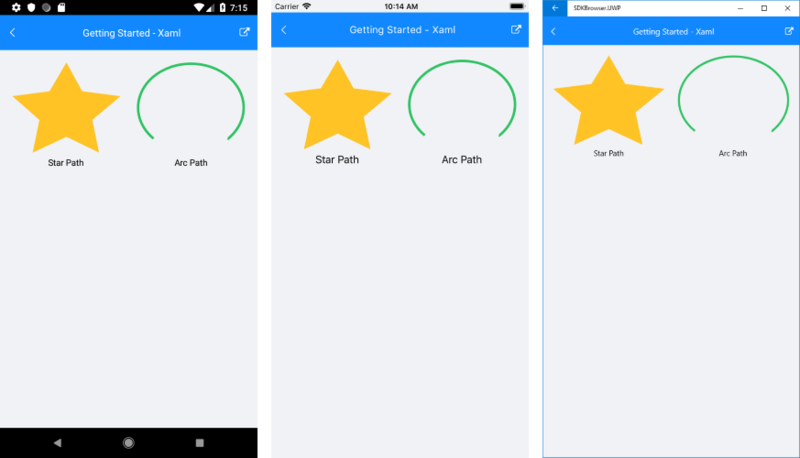 There are several built-in geometries which can be found in the Telerik.XamarinForms.Input.Geometries static class. Both RadPath objects appearance can be reviewed in Figure 1. SDK Browser and QSF applications contain different examples that show RadPath's main features. You can find the applications in the Examples and QSF folders of your local Telerik UI for Xamarin installation.